I tend to use small amounts of eye contour products at a time because my eyes can be quite sensitive, but if you tend to use more then a full size could last you up to a couple of months or longer. For me, however, a 5ml sample has been lasting me a long time. Therefore, a full 15ml size would be suitable for a long time. Whilst I don’t tend to apply my eye products so delicately and with such flair, as long as it is massaged around the eye area, you’re on the right track. I find this gel to absorb incredibly quickly. It also dries non-greasy which is fantastic for the application of makeup over the top. Also, as it is a gel product, it will help if you suffer from panda eyes due to your mascara. As I mentioned in my Diorshow Iconic Mascara review, I have recently discovered that the use of cream-based eye products under makeup causes my mascara to smudge. When I use gel eye products, the smudge doesn’t happen. This may not be the case for everybody, but it is a tip that I have found very useful! I find that whilst this eye gel does help significantly with the fatigue and hydration around my eye area and only a small amount with puffiness, it isn’t designed to help with other common eye contour issues such as dark circles or fine lines and wrinkles. I have been using this product in the mornings, underneath my makeup. I have found it to really help my face to look less tired overall, which is fantastic. It does as it claims. However, as I also battle dark circles (which I also find to contribute to the tired look), I have taken to using a different eye cream at night time. Most recently I have been using Balance Me’s Wonder Eye Cream which I received in my July Birchbox. Using the two in combination has been making a great thing better - I have one product to fight the fatigue in the day and one to fight the dark circles as I sleep! Therefore, overall, if you are after a product that helps with the signs of fatigue, then definitely give this product a go. If you are looking for an eye product that meets more demands, then you may be disappointed with this. In regards to the price, I think that some may find this product to not be worth it for the results that you see. My argument against that is again, it depends on how much you use each time. I personally find the price acceptable because I use little and it makes the product last much longer. With the use of more product then you may not see it as worth it because you will be going through them rather fast. 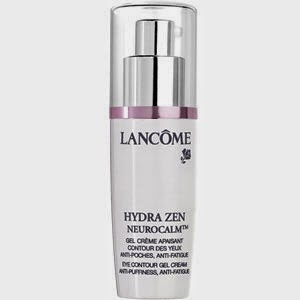 Lancome’s Hydra Zen Neurocalm Eye Contour Gel is £32 for 15ml from most places, but you can buy it from All Beauty for £27.85. For the full price though you can buy it from Boots, Feel Unique, John Lewis, House of Fraser or the Lancome website. What are your favourite eye products? Have you tried Hydra Zen?